t was mid-December 1977, and RSO label chief Al Coury felt relaxed. His latest album, the soundtrack of Saturday Night Fever, had just been released -- a million copies to the stores, 750,000 more stockpiled in a warehouse. That was enough for a good three or four weeks, easily. With great confidence, he left on a one-week Christmas vacation. Four days later, everything was gone -- sold -- every album, eight-track, and cassette. "That's when we felt the real impact of the film," he said. No one had seen such record sales since the advent of the Beatles, fourteen years before. In less than six months, Saturday Night Fever shattered all previous highs to become the largest-selling album in history. It set another record by climbing to the top of the album charts for an amazing 24 weeks. Industry "experts" were dumbfounded: this package broke three cardinal rules of merchandising. Soundtracks, various artists compilations, and anything containing oldies were traditionally thought of as poor sellers. Yet this monster was all three, rolled into one. K.C. and the Sunshine Band, Tavares, Kool and the Gang, Ralph McDonald, MFSB, and David Shire all contributed tracks to Saturday Night Fever. In addition, there were hits by the Trammps ("Disco Inferno"), Yvonne Elliman ("If I Can't Have You"), Walter Murphy ("A Fifth of Beethoven"), and the Bee Gees ("Jive Talkin'," "You Should Be Dancing," "How Deep Is Your Love," "Stayin' Alive" and "Night Fever"). The latter song worked so well that the movie title actually changed to fit it. "Robert Stigwood, the producer, wanted to call the film ' Saturday Night, ' said Robin Gibb. "And we had already written the song 'Night Fever'. We told him we didn't like the title ' Saturday Night ' and he said he didn't want to call the movie just ' Night Fever. ' So he thought it over for a while, called us back, and said, 'O.K., let's compromise. Let's call it ' Saturday Night Fever. ' We said, 'All right, that's great. So we'll keep it at that'." 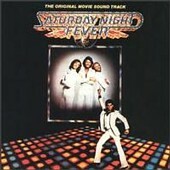 The song "Night Fever" was actually the first one written by the Bee Gees for the picture. Released as a single early in February 1978, it peaked in April, spending eight weeks at the top of the chart. In all, it spent nearly five months on the best-seller list. The record was also a hit in England -- their first number-one song there in nearly ten years. 1978 was truly the time of the Bee Gees. Because they had made Criteria Studios in north Miami their home, the Governor of Florida made Barry, Robin and Maurice honarary citizens of the state. Governor Jim Williams said the Bee Gees' presence "enhanced the quality of the musical and entertainment community in the state, and is reflective of the outstanding technical facilities and personnel available in Florida." The Miami Beach Tourist Development Authority then jumped in, and asked the boys to compose an official Miami Beach theme song, but they respectfully declined. The Saturday Night Fever project led to five Grammy Awards for the Bee Gees: Album of the Year (as artists), Album of the Year (as producers), Best Pop Vocal Performance by a Duo, Group or Chorus, Best Arrangement for Voices (for "Stayin' Alive"), and Producers of the Year. In addition, "How Deep Is Your Love," one of the "oldies" on the set, was a previous Grammy winner, as Best Pop Vocal Performance by a Duo, Group or Chorus. Incredibly, despite the immense impact of the film and its music, not a single song from Saturday Night Fever earned an Academy Award nomination.